Nuclear receptors are popular targets for drug companies searching for new therapeutics for cancer and cardiovascular, metabolic, inflammatory, and other diseases. Indigo Biosciences in State College, PA, designs and sells nuclear receptor assay kits to speed the discovery of new drugs. While at Penn State University, Jack Vanden Heuvel, Ph.D., and Blake Peterson, Ph.D., developed the technology platform that screens for nuclear receptor activity. Soon after, pharmaceutical companies began asking them to test compounds in their academic laboratories. “That’s when we realized a business could be built around our technology, and we launched Indigo Biosciences as a service provider in 2005,” says Dr. Vanden Heuvel, CSO. Nuclear receptors are transcription factors that bind specifically to small molecules, hormones, drugs, and other chemicals to regulate specific genes and control cellular metabolism, homeostasis, and development. Agents that interact with nuclear receptors are the focus of research programs at numerous pharmaceutical and biotechnology firms. Indigo’s goal is to identify novel compounds with on-target or potentially dangerous off-target bioactivities. “There are many areas where we can help pharmaceutical companies build their pipeline and eliminate risk,” adds Dr. Vanden Heuvel. All the nuclear receptor assay kits offered by Indigo Biosciences contain live reporter cells that are protected during shipping with a cryopreservation process called CryoMite™. The cryopreservation method keeps 95% of cells alive during freezing and thawing. “People have frozen mammalian cells for a long time, but they have a high mortality rate when warmed up,” explains Bruce Sherf, CTO. 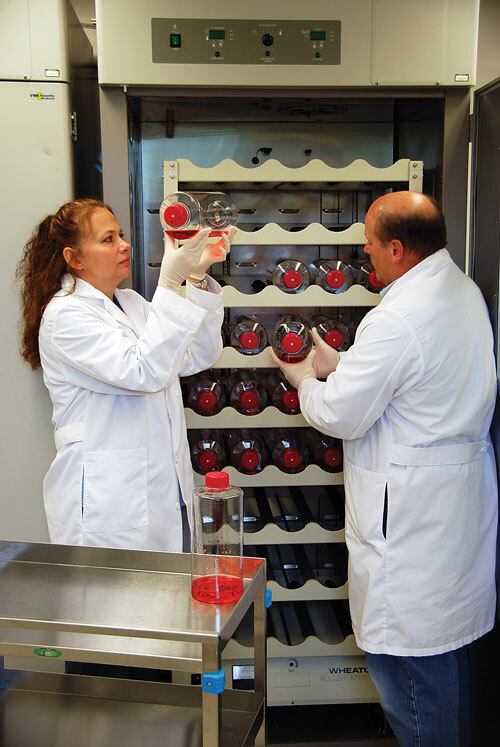 The CryoMite technology transformed Indigo from being a service provider into a product provider of assay kits. “The ability to ship cells overnight and maintain a high cell viability is unique among our competitors,” adds Sherf. Most other companies in the nuclear receptor field sell naked DNA vectors that encode various genetic elements. Customers must generate their own reporter cells and develop and optimize assays in their laboratories. In contrast, “we provide a complete, optimized assay system with reporter cells, positive controls, and reagents. It’s a lab-in-a-box, and customers only need to supply instrumentation.” Researchers obtain data within 24 hours by following four easy steps: thaw, feed, dose, and read. Flexible manufacturing capacity allows Indigo Biosciences to offer high-throughput screening customers rapid production of custom-scale bulk reagents. Indigo’s nuclear receptor products feature healthy, dividing mammalian cells engineered to express a specific human nuclear receptor. Scientists can use these assays in low- or high-throughput screenings of test compounds. “The discovery of novel compounds with either agonist or antagonist activity against a specific nuclear receptor target is the first critical step in the long process of new drug development,” says Sherf. The newest assay kit, launched in August, is the Human TR Alpha (TRα) Reporter Assay System. It provides high-level expression of human thyroid hormone receptor a. Companies looking for markers and treatments for metabolic diseases such as high triglycerides or cholesterol may benefit from targeting the TRα receptor. In June, Indigo released the Human Constitutive Androstane Receptor, or CAR, Assay Kit. This nuclear hormone receptor is important for the detoxification of foreign substances, including drugs taken simultaneously by patients. CAR regulates enzymes such as cytochrome P450, which, in turn, metabolize other pharmaceuticals. “Screening with CAR detects potential toxicity from drug-drug interactions,” says Dr. Vanden Heuvel. Indigo Biosciences introduced the Human Retinoid X Receptor Alpha (RXRα) Assay System in April. RXRα is a nuclear hormone receptor located in liver, heart, lung, and kidney cells that regulates a variety of biological pathways. “RXRα is particularly a target of drugs and nutrients involved in reducing inflammation and metabolic disorders,” Dr. Vanden Heuvel adds. Also included in Indigo’s current offering are kits for human peroxisome proliferator-activated (PPAR) receptors, human estrogen receptors, liver X receptors, glucocorticoid receptor, farnesoid receptor, and mineralocorticoid receptor. Kits are also available that combine PPAR, estrogen, and liver X receptors, which offer convenience and value to customers. All Nuclear Receptor Reporter Assay Systems use stable-glow luciferase chemistry, which allows plates to be processed in batch mode, and they are optimally configured for processing in 3 x 32-, 96-, and 384-well plate formats. Each kit contains nuclear receptor reporter cells, an assay plate, culture media, positive-control agonist, detection reagents, and a detailed technical manual and protocol quick guide. All assay products are shipped by overnight delivery and may be stored at customers’s facilities until needed. Indigo sells its products in North America, Asia, and Europe. Indigo continues to expand its facilities, sales operations, and product pipeline. Over the next two years it will create kits for many other human nuclear receptors. “Then we’ll move into developing nuclear receptor assays for alternative species,” says Sherf. Pharmaceutical companies are in need of cell-based mouse, rat, dog, and monkey nuclear receptor assays to test promising compounds before advancing to preclinical studies. Such assays help drug makers to predict whether a drug tested in lab animals will have similar potency and effects to those observed with the human receptor. “We have lots of inquiries from clients wanting nuclear receptor assays for alternative species,” Dr. Vanden Heuvel says. Additionally, Indigo is broadening its focus to include products and instrumentation that complement its core nuclear receptor assays. Heading the list is a Live Cell Multiplex Assay (LCMA) to be launched late in 2010. The LCMA kit quantifies live reporter cells in each assay well. It is specifically optimized to interface with existing nuclear receptor assays in a multiplex protocol. It is important to assess cytotoxic effects during the secondary screens of potential lead compounds, particularly when screening for antagonists. “Measuring cell viability is necessary to eliminate false-positive results, and right now there is no good way to do this in a multiplex format,” explains Sherf. The company also continues to provide service testing. Clients send compounds to Indigo, and their in-house experts evaluate and optimize types of nuclear receptors and return the data. “Our company started with these types of services, and we are committed to improving and expanding them,” comments Dr. Vanden Heuvel.